According to a recent study by the CDC, “Obesity rates for children with disabilities are 58% higher than for children without disabilities.” Our two guests have taken action towards a solution. 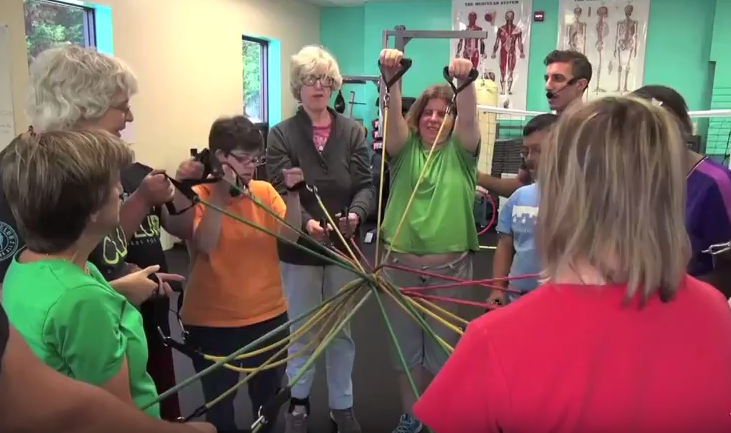 Host Pat Shoemaker speaks with Jared Ciner, the Executive Director and founder of Social Physical Interactive Respectful Inclusive Teamwork Club (S.P.I. R. I. T.), fitness for all, and Sam Smith, an Assistant Trainer with Spirit Club. Sam is the first person hired by Jared. Jared, Sam and The S.P.I.R.I.T. Club provide inspiration for all of us! Connecting Our Community airs Wednesdays at 8:30 p.m. on Channel 21. Hello I was at the Spirit Club with my best friends Jared, Justin, and Sam for a while and my mom pulled me out of it because they weren’t really helping me get fit that’s what my mom said about them that’s not true. I just can’t believe that my Jared is married I told him that I didn’t want to loose him at all. I still love Jared and I want him to stay single for a long time and I didn’t know that he was married until now.